that, the Ethiopian military in Central Somalia intercepted an Eritrean attempt to smuggle powerful rockets to the Southern Somalia as well as Somali territory in Ethiopia on a Yemeni commercial small boat off the coast of Puntland and Galmudug regional States of Somalia. 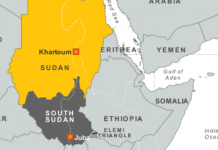 For regional stability, Ethiopia’s Military Intelligence are monitoring Eritrean and Yemeni arms-smuggling and terror-financing networks across the Horn of African lines, IGAD2020 regional security sources revealed this week. The UN reports last week concluded that Eritrea’s behavior should be viewed in the context of its unresolved border dispute with Ethiopia, a legacy of the 1998-2000 war between the two neighbors, and the resulting insecurity felt in Asmara, about it giant neighbor’s intentions. Ethiopia should return Badme to Ethiopia. Then we can stop every thing that harm your country. So stop moaning and do the right thing, i.e, leave all Eritrean lands. I am afraid to the north of Ethiopia another Somalia is going to be created. Eritrea is clearly heading this way. cutting his hands off. god bless ethiopian special forces. keep exposing the eritrean rutless regim. It is funny this is news , how is shaebia able to deliver weapons to Somalia ? the terrorists do not need Eritrean weapons they have the current Somalilan government selling western weapons to them. Shaebia is buzy killing his own people and monitoring their own people inside and outside. Did they say they captured materials to build nuclear bomb? How can such a garbage news be considered in your website? Please we are tired of Government version of the stories. Try to verify through independent means before publishing it in your website, otherwise we all know what the Ethiopian intelligence are supposed to say: Day dreaming stories. እንዳ በሉ ኣማኢት ኣሽሓት ኢትዮጵያውያን ኣብ ኤርትራ ተቐቢሮም ከም ድኹዒ የገልግሉና ኣለው። ድሒሮም ውን ተጋሩ ስዒቦም። ሕጂ ከ እንታይ ክደግሙ እዮም ዝደልዩ ዘለው? ከምቲ ያሬድ ዝበልካዮ፡ ኤርትራ ዘይ ኮነት ናብ ሶማል ትቕየር ዘላ፡ ኢትዮጵያ እያ ሶማል ክትከውን። ተጋሩ ከኣ ድሕሪ 5 ዓመት ይቕረ በሉልና በዲልናኩም እንዳ በሉ ክስደዱ ክጅምሩ እዮም። kikikikikikikikiki Amazing Comment Ever Seen! I Can’t Stop Laughing! Eritrea should leave Ethiopian territory of Assab and will live in peace. Otherwise it will be the end of this shifta fake moonscaped country. People like Patricia need the basis courses of History. Since when is Assab a territory of Ethiopia? Eritrean territory is sacrosanct. Blood is paid to every inch of the land and handful of soil. Ethiopians need to worry about the big problem coming and get prepared to deal with the new front. Egyptian army is reorganizing and wage war against Ethiopia. Eritrea isolated and economically sanctions on bogus reasons will remain strong in the long run.The lies and treason of woyannes will lead them to destruction. 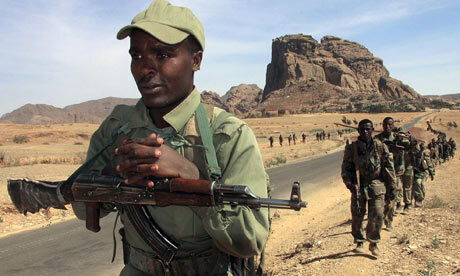 The current problem of Eritrea concerns Eritreans and will not lead to war like we are witnessing in Somalia. those who prophesies such idea belong to another planet. ETHIOPIA IS MOVING AHEAD IN ALL ASPECTS! BUT ERITREA THE FAILING STATE WILL SOON BE DISINTEGRATED! REGIME CHANGE IS REALLY NEEDED IN ERITREA! THE DICTATORSHIP GOV’CE IS DOING NOTHING RATHER THAN OPPRESSING ITS CITIZENS DEPRIVING THEIR RIGHT TO LIVE, MOVE FROM PLACE TO PLACE, MAKE ASSOCIATIONS…ETC. ANY WAYS ERITREA BY BY NO MEANS WILL BE COMPARED TO ETHIOPIA! ETHIOPIA IS IN THE TRACK OF DEVELOPMENT. ETHIOPIA, ONE OF THE 20 WORLDS’ COUNTRIES FASTEST GROWING ECONOMY. ERITREA, FAILING STATE UNDER GOVERNANCE OF DICTATORSHIP. Eritreans we have hard time with our leaders our kids are servants without pay .we have nightmare that never end .Ethiopians & Somalians are not our problem it is our government is our problem. If our government go away we will talk with Ethiopia. Badma people are the one who are suffering.if you ask them they do not care to be Ethiopians or Eritreans they want peace.After all they are next it is hard to now who is who.The reality is north Ethiopia & Eritrea happen to be one people .White people call our case civil war because we have the same history.I wish people learn their history & think before they kill each other! no! fear egypt, no fear eritrea, no fear alsheba!!!!!! If you are still holding such outdated concepts of identity and nationalism,it is hard to speak about future commonality interests of the region.Look at the history of Europe and America in 16th,17th and 18th century,it was the same as with what we do today.But,today things are totally changed.They came to realized the devastating impacts of confrontations. The EU evolution itself masculinized by their broader understanding of commonality interests in cooperation than competition. The same ways have also been adopted by many South Asian and east Asian countries.If so,why we do make indifference from adopting the advantages of such wonderful experience and why we don’t look for the broader interest of the people than narrow interests. I can not stop from loughing of the Ethiopian inteligence. They are always good on sniffing Eritrean weapons. LOL. What else did they get? They have a great deal of dimensia even in their day dream they see any thing they think it is Eritrea. What is our goal? I accept Biyan’s Idea. None of us; will not want to lose our dignity and sovereignty. This is true, why we dispute each other? We can note change the past scenario if interact like this. We can live peacefully by accepting the current two historical country and their populations. Unit is very important. It is true we face a problem secondary to westerns sabotage. But hadn’t we disproof this condition? Yes it is true; Victory over Alshebaba is palpable; it is a time charge only!!! So how this issue is a headache of Eritrean people? They have to be support us. Government might be good or bad for every country, but changing of this issue is note mandate of other country. So we need peace and security rather than say over ambiguous while the true is another.